Oh, the terrible raglan sleeve! I lived through the 80’s. I still have nightmares about these things (bolstered out by shoulder pads, of course). 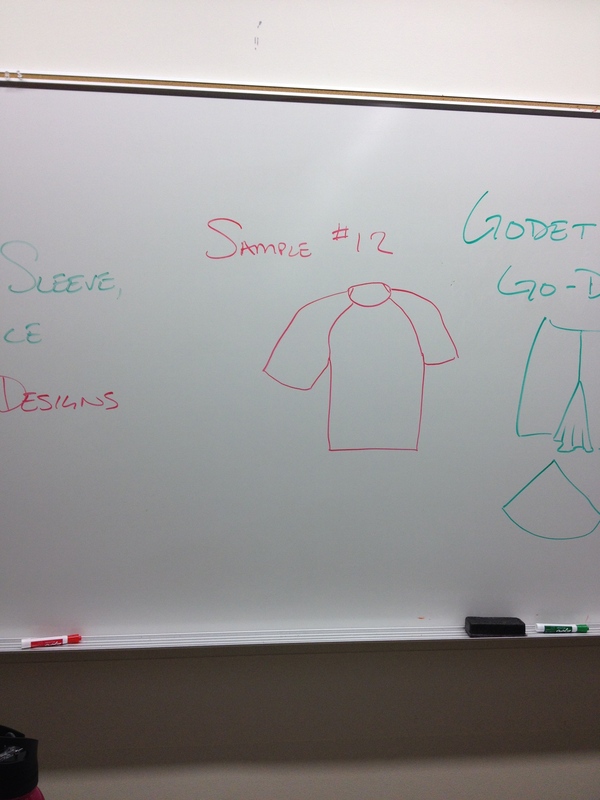 For clarity, this is a rough drawing of a raglan sleeve shirt. On the other hand, it’s an interesting pattern. 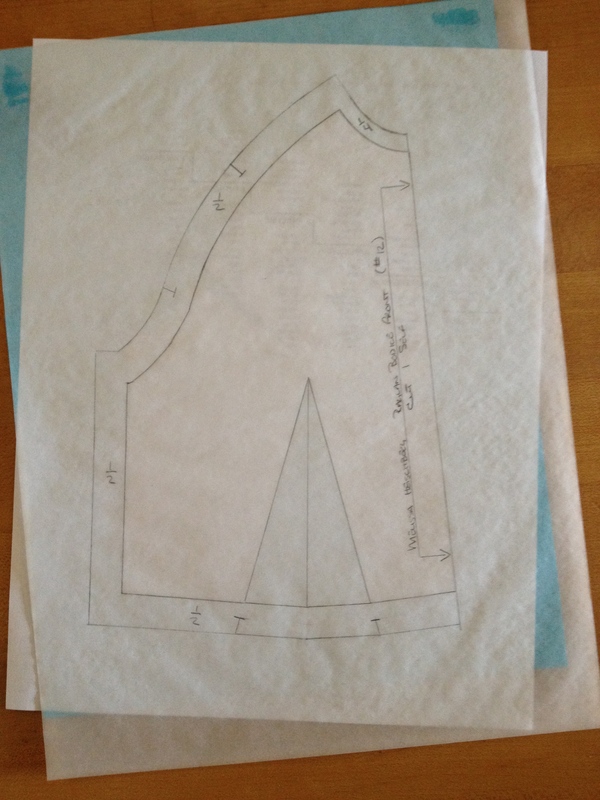 The deal with the raglan sleeve is that it absorbs the shoulder part of the bodice. In order to make this happen, the bodice has to be adjusted. This process makes it impossible for the normal ease to be added into the sleeve head. Since ease exists to allow freedom of movement, the armscye of a raglan is adjusted to add for movement at the bottom, rather than the top. If your block has a back shoulder dart, you need to remove this by transferring it into the armscye. 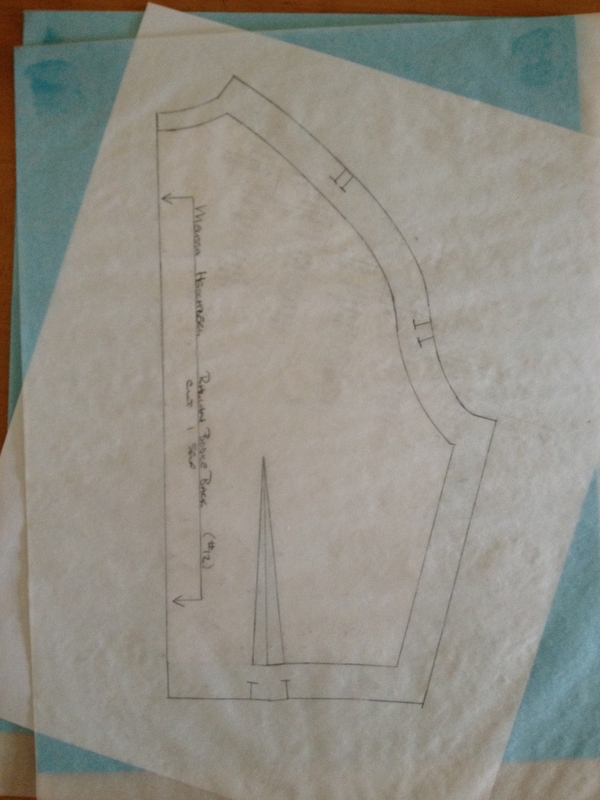 Draw your transfer line to the center of the straight part of the armscye. I’m using the HBL for this, as it’s about right. 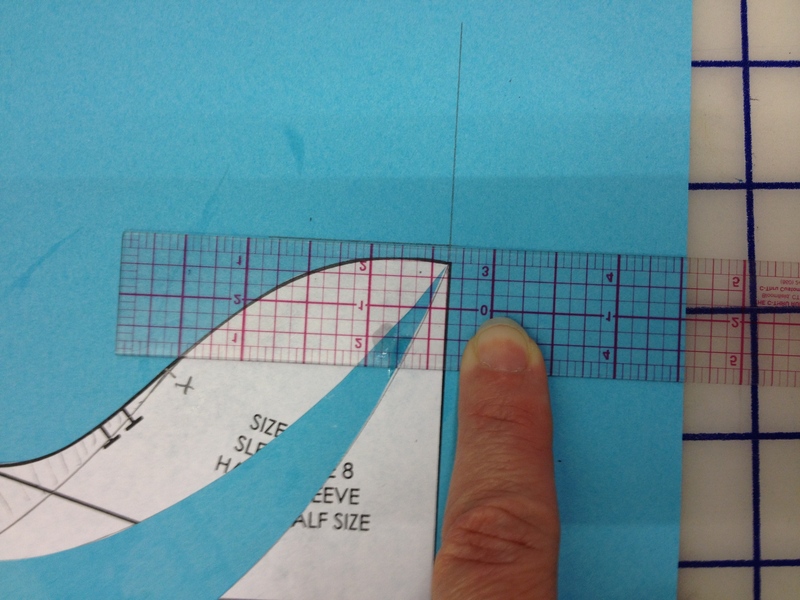 Draw a guide 1″ below the current armscye (for half scale). True out the back armscye with a line that starts at the shoulder tip, passes along the existing armscye below the dart transfer, and comes in to the 1″ guide below the armscye. Something similar happens in front. Open out a wee little 1/4″ slash where the armscye goes from straight to curved, drop the armscye 1″ at the side seam, and true in the new line. 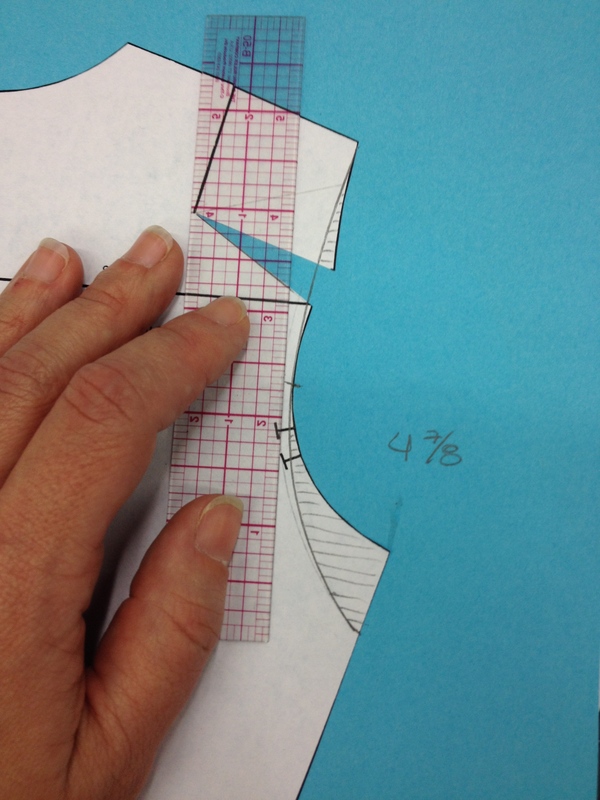 If you’ve been paying attention to all these demos, you might be thinking, “Gosh, missa, those corners are pretty far from square at the side seam!” If you’re thinking this, I’m very proud. :) There’s a reason I’m not too worried about it this once. The raglan sleeve isn’t set in like a typical sleeve. 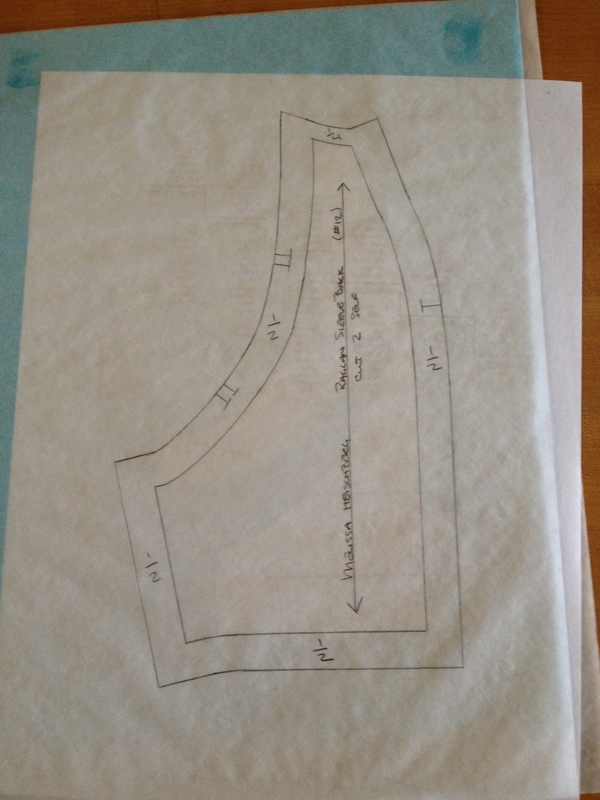 Instead of making up the body, making up the sleeve, easing down the sleeve-head, then setting the sleeve, it’s far more common to attach the sleeve halves to the body halves, then sew the completed halves together at the shoulder/outer arm and side seams. So that angle is still conceptually annoying, but also really common. To finish up the front and back bodice adjustments, we need to sort out which part of the shoulder will become part of the sleeve. Measure both armscyes. Mark a guide at the half way point. (My armscye here measures 4 7/8″, so I marked my guide at 2 7/16″. You must measure your own – don’t assume we drew the exact same curve!) Write down these measurements: you will need them again. Draw a line from the neck to your half-way guide on the armscye. The location on the neck isn’t so important, but I used 1″ from the shoulder for this demo. 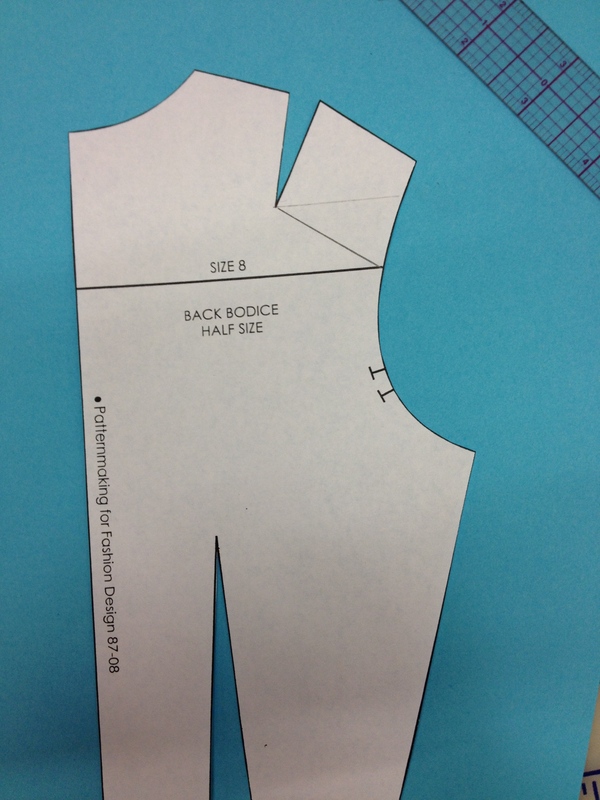 At the middle of this line, mark a guide 1/4″ up into the shoulder (3/8″ for a full sized human). 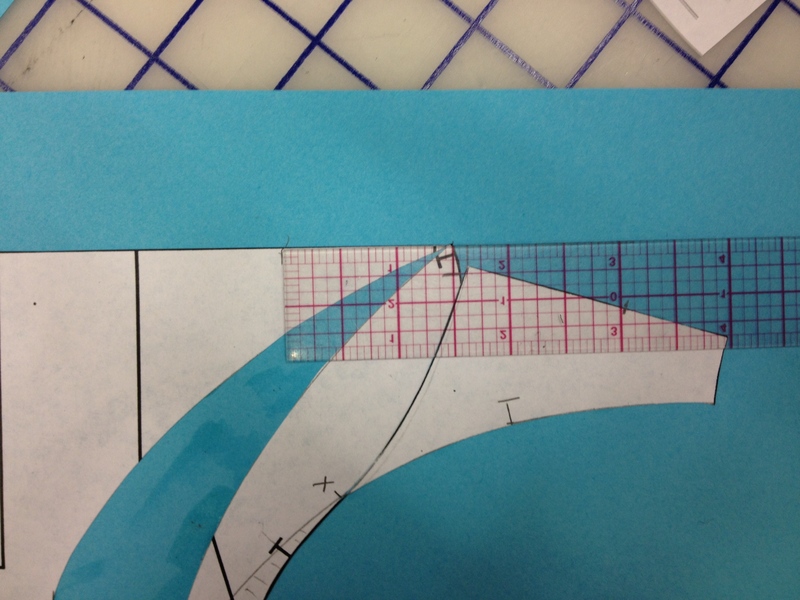 Adjust your straight line into a smooth curve that starts from the existing ends and meets the guide. This will be your cutting line, so make sure it has a notch! 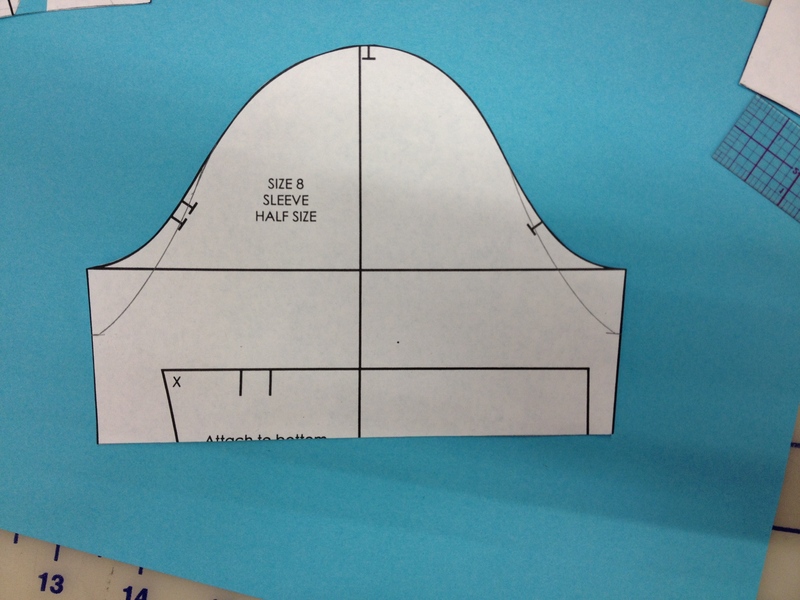 We’re doing this because slight curves often look straighter on the human body than straight lines do, and also because that nice smooth curve from the neck into the armscye will be much easier to sew up. Do the same thing in the back. 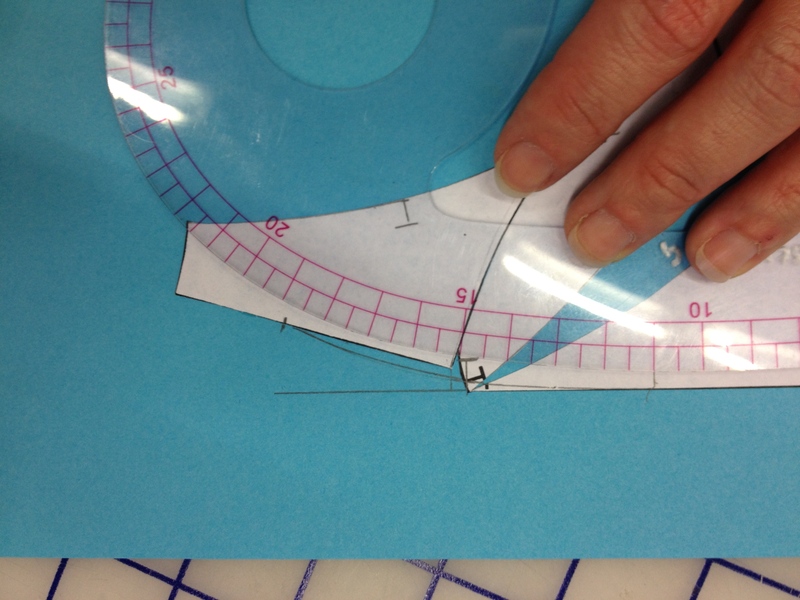 Make sure there are no angles or really sharp curves where the armscye and cutting line meet. Now we can prepare the sleeves. Since we dropped the body armscyes by an inch, we need to do the same to our sleeve. 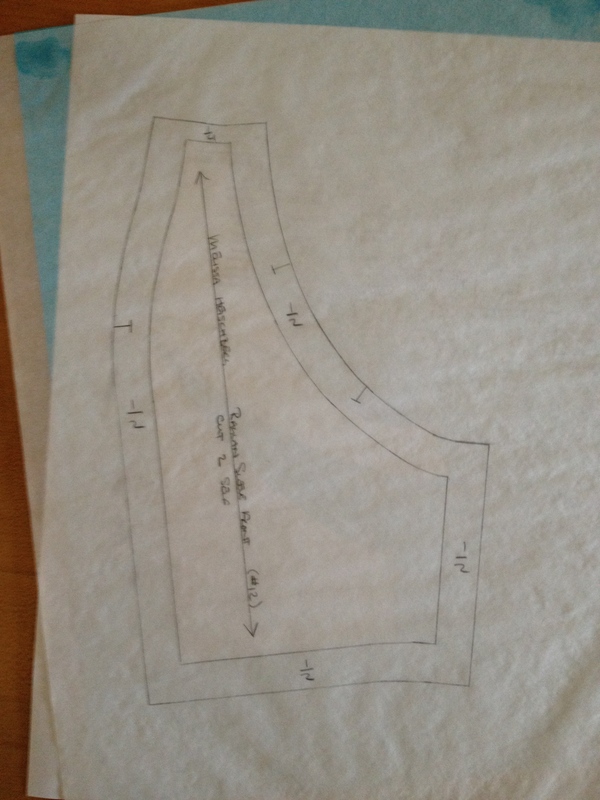 Cut the sleeve in half down the center line. Connect the tip of the shoulder to a point about 1″ below the adjusted armscye with a smooth curve on both halves of the sleeve. 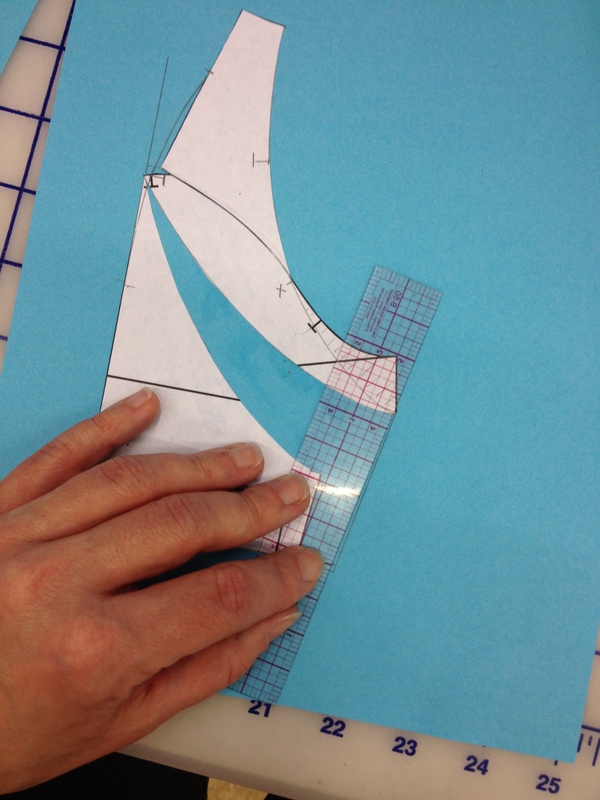 Cut along this line, and spread the sleeve open 1″ to create more ease for movement. Mark a guideline 1/8″ above the shoulder tip. 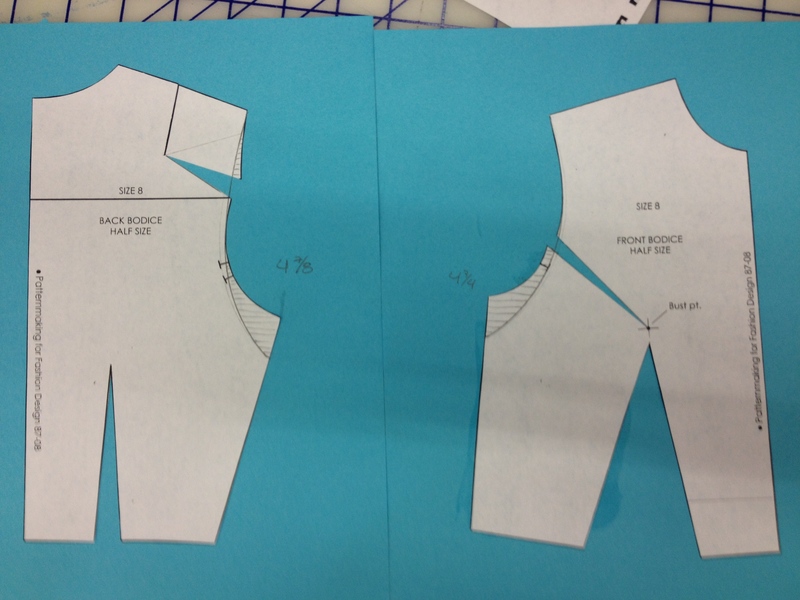 This is where you need the front and back half-armscye measurements that you wrote down. 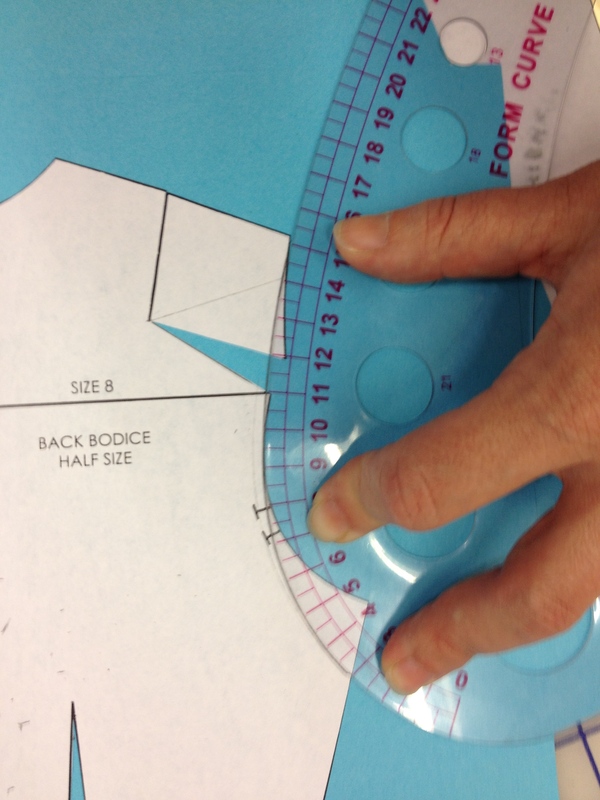 On the sleeve halves, measure the half-measurement for each side, starting from the side seam. (That’s really important!) Mark a guide. I labeled mine X so that it’s different from all the other guides we have going on. Match the bottom corner of the shoulder piece to the guide (X), and the top corner to the 1/8″ guide above the tip of the sleeve. 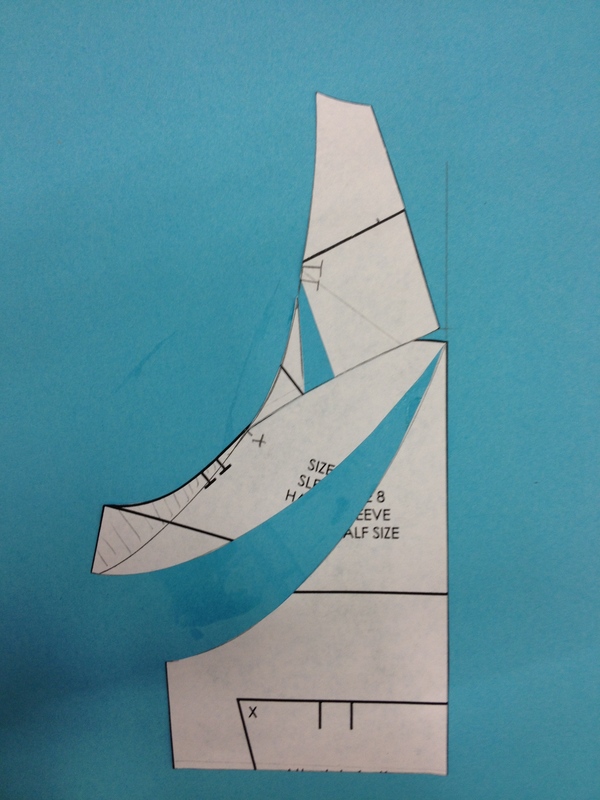 The piece will overlap the sleeve slightly. That’s ok. Do the same with the other side. If you transferred a dart on your back shoulder, you should have a piece that looks like a weird happy-cartoon-dog like this. Otherwise, both your pieces will be kind of like this but without the “eye” – just the “grin”. 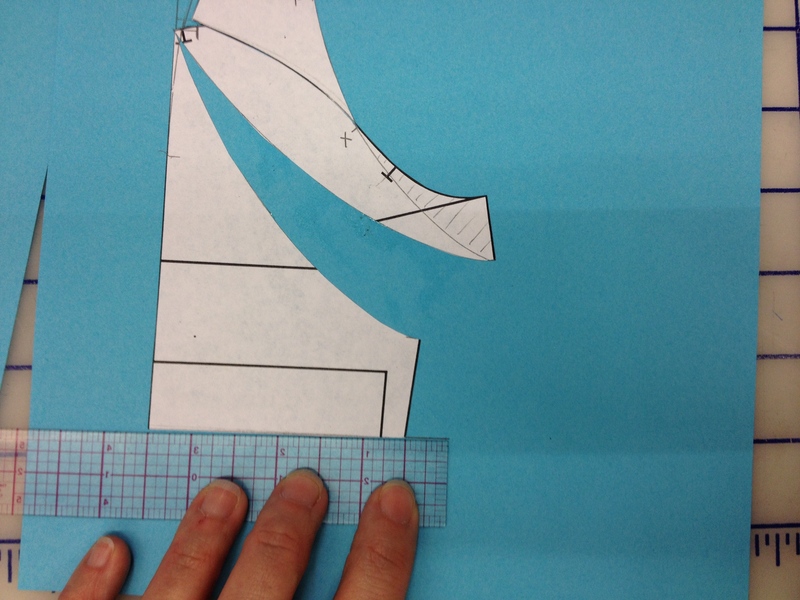 Mark a guide 1 1/2″ down (half scale) from the shoulder tip. Mark another 1″ in from the top neck corner of the raglan. Connect these with the smoothest line possible. 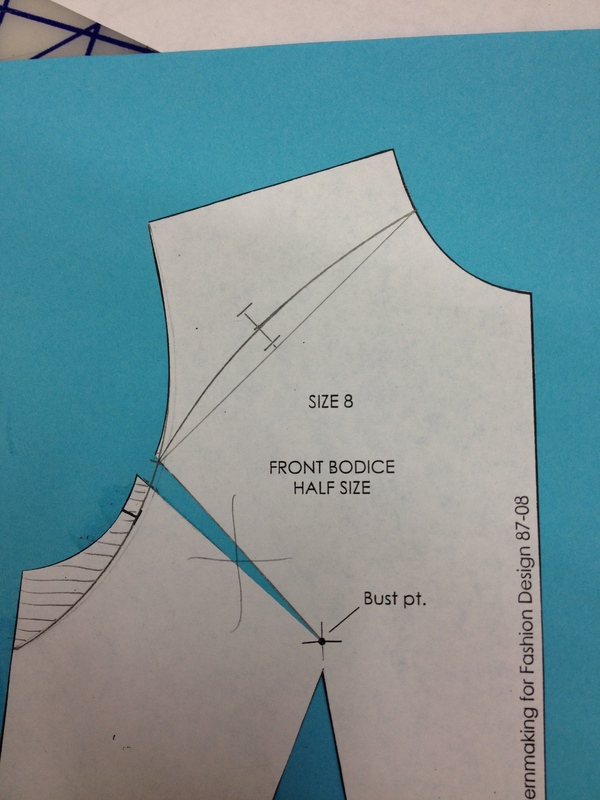 For a short sleeve like this, we’re going to add 1/2″ of ease to the bottom for movement. Connect the new armscye corner with the 1/2″ line to make a new underarm seam. Do the same with the other half of the sleeve. Do not forget notches. By the way, nice pattern work! You’re welcome, Hannah! I will try to get to a demo on a one piece raglan. Most of the steps are the same, except don’t split the sleeve in half. The guidelines for adding ease into the armscye/sleeve head are differnt. The one piece raglan ends up a little roomier in the shoulder.